What is the most important factor in Forex trading? I have over 17 years of trading experience and I have learned a lot over that time. So I thought I would share some lessons that I had to learn the hard way. If you incorporate these lessons into your trading you can greatly reduce your learning curve, so let’s get started! New traders tend to think that real traders enter trades every day. Real traders wait for good trading opportunities and only then do they enter trades. There will inevitably be some days where good opportunities simply do not arise. There will be days when volatility is too low to get any decent trades and there will be days when volatility is too high to enter trades safely. There can be hundreds of valid reasons when it’s smartest not to trade. The best traders know when it’s time to sit on their hands and wait. Whereas most new traders force themselves to take trades because they think they should be trading. They enter bad setups and take a loss when they should have never traded in the first place. If you force yourself to take trades when there are no valid trade setups you will lose more than you need to, which is never good. The number one rule of trades is not to lose money. You do not need to trade every single day in order to be a trader. Sometimes the smartest move you can make is to wait until tomorrow. Losing streaks are a normal part of trading and you will never eliminate them. 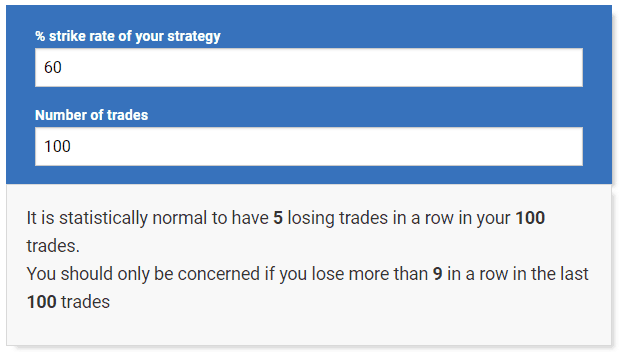 With a 60% win rate it is statistically normal to experience 5 losses in a row over the course of 100 trades. It’s not easy to calculate expected losing streaks based on win rate as it involves complex probability mathematics. Which why I had the calculator in the image above created for Forex Mastermind members. So if you have a losing streak you are not doing anything wrong! It is normal, every trader experiences it. Even traders with absurdly high win rates in the 80% range suffer losing streaks of 3 statistically. So next time you are in the middle of a losing streak do not freak out and make changes to your strategy. Just keep on trading because your next winning streak is just around the corner! No other tool has helped me develop so much as a trader. Now, when I say journal I do not mean the “dear journal, today I took three trades” type. I mean a spreadsheet that allows me to track important information about my trades. The image above shows only a small part of the trade journal I use and as you can see it goes far beyond the simple trade log provided by your broker. 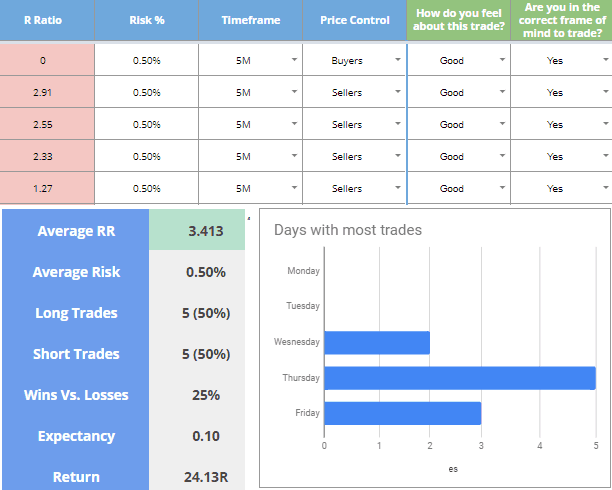 In a proper trading journal you can include much more information. 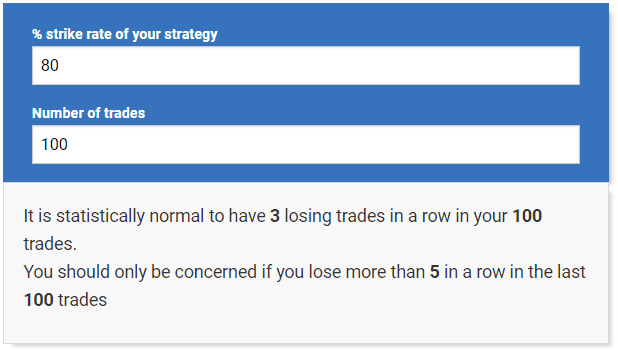 Imagine being able to look back on your last 50 trades and identify similarities between all your losses and all your wins. If all (or many) of your losses have something in common then you can eliminate that factor or put something in place to limit it. Logically this is going to lead to less losses and higher profitability. Trading is all about refining your trading strategy and refining yourself as a trader. A trading journal allows you to spot faults in your trading that you would never be able to spot otherwise. And when you spot those faults you can get rid of them! It also allows you to spot what you are doing right, so you can do more of that. A trading journal is without a doubt the most important tool in my trading. Without it I doubt I would still be trading today. Looking at your charts for several hours every day of the week can lead to chart burnout. What are the symptoms of chart burnout? Seeing trade setups that aren’t really there (I don’t mean hallucinations) – What I mean is that you will spot a really crappy setup that is not tradable and convince yourself that it’s worth entering. Trading out of boredom – If you stare at a chart long enough and you do not spot setups you might find yourself jumping into weak trades out of boredom. Dreaming of candles – This may sound like a joke but it’s not. I have had this happen to me many times and I know a lot of traders who have. Staring at charts so long day in day out that candlesticks start invading your dreams… this is usually a bad sign. Getting bored of trading – Chart burnout can lead to you simply getting bored of trading and trading becoming a chore. There are more symptoms but these are the main ones. Chart Burnout is a very real thing and it can have a negative impact on your trading results. You need to take a break from your charts for a few days every month. I like to take a three or four day weekend once a month at least! To be honest I usually end up doing this twice per month. However, I have a large enough trading account that I do not need to trade as often so this may not be a good idea for everyone! This is just a general rule of thumb that every self-employed person needs to consider. If Forex trading becomes your main source of income (or your only source) you need to have an emergency fund for when you cannot trade. The market can become very hard to trade for a few weeks or even months. In 2014, we had a three month period of extremely low volatility. While you could still trade profitably in this period, there were far less trading opportunities than normal. Most traders did not hit their usual profit targets in this three month period. It doesn’t even need to be an issue with the Forex market itself. You could get hit by a bus and end up in hospital for three months recovering from injuries. I know this is an extreme example but you never know what can happen. Having an emergency fund that can get you through 3 months of no trading or longer is always a good idea. Some of my students have gone through situations in which an emergency fund helped them immensely. Even better is having a secondary source of income which is part of the reason I run forex4noobs! Hope you’ve learned something valuable! I had to learn these lessons the hard way over my 17 year trading career. You can learn them much easier and quicker by bookmarking this article and referring back to it regularly! Also, don’t forget to share it with anyone who you think would benefit from some insider knowledge!